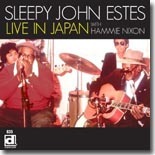 Sleepy John Estes was one of the most respected figures in pre-war and post-war blues. The Brownsville, Tennessee resident is renowned for blues classics like “Floating Bridge,” “Drop Down Mama,” Diving Duck Blues,” and “Someday Baby.” Known as the “Poet of the Blues,” Estes had one of the most voices in the blues, probably dating back to his days as a work-gang leader for the railroad. Estes enjoyed a lengthy tenure with Delmark Records, dating back to the ’60s until his death in 1977. The label has recently issued Live in Japan with Hammie Nixon, a 21-song set collecting several Estes performance with his longtime musical partner between 1974 and 1976, in front of several enthusiastic Japanese audiences. Nixon began playing with Estes in the early ’20s and the pair worked together over 50 years. It’s obvious from their rapport on these performances that they very much enjoyed working together. In fact, Nixon is much more than your run-of-the-mill sideman, as he shared vocals with Estes and provides intuitive backing on harmonica, kazoo, and jug (all three on the opening track, “Corrina Corrina”). The first 11 tracks were recorded in 1974 and they include “Broke and Hungry,” and the spirited “You Shouldn’t Say That” and “Tin Pan Alley.” The gospel track, “Holy Spirit, Don’t You Leave Me,” is a stirring, but short track that features Nixon taking lead vocals and the pair share the lead on the classic “I’ll Be Glad When You’re Dead, You Rascal You.” The Estes favorites, “Divin’ Duck Blues” and “The Girl I Love, She Got Long Curly Hair,” are also featured on this set. The final three tracks were also recorded in December of 1976, on Christmas Eve, and feature the duo with unobtrusive backing from the Japanese band Yu Ka Dan. This set includes a great version of “Brownsville Blues” and a moving “Jesus Is On The Mainline,” that closes the disc. Live in Japan was previously available only as a pair of LPs in Japan, so Delmark has done a wonderful thing by making these available worldwide. This set is a great addition to the catalog and legacy of Sleepy John Estes and should be required listening for fans of traditional country blues.